I’m often full of restless energy, and I like to fiddle with things while I think. A year or so ago I finally figured out that, hey, maybe it’d be useful to keep some dedicated “fidget toys” handy to keep my hands busy, rather than just using whatever’s nearby. I’ve tried and set aside a lot of different options over the past few months, and last week I found one that hits a lot of high notes for me. 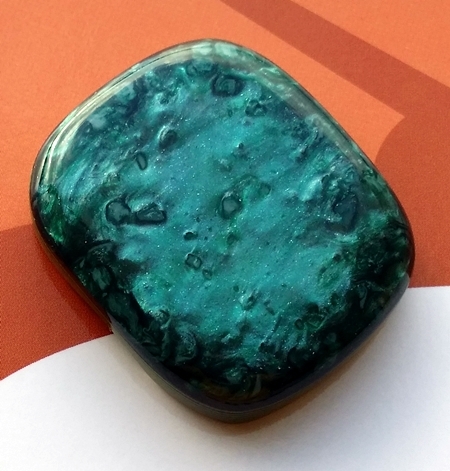 Most worry stones I’ve seen are smooth, sometimes with a recess for your thumb. I find textured (or mixed smooth/textured) things more fun to fiddle with, so I wanted something different. I considered a coin, but as interesting as coins are, they don’t always offer much texture — and the ones large enough to fiddle with tend to be heavy, too. I wanted something light, textured, silent, air travel-friendly, and pocketable that wouldn’t raise any eyebrows in social settings. I also wanted something that would, if possible, convey to other folks that I’m not bored, just bleeding off energy. 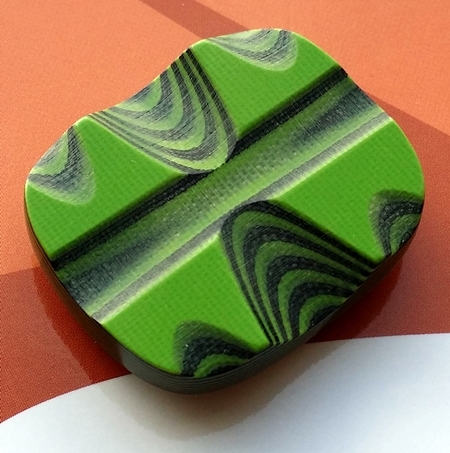 I stumbled across a worry stone by SoCal Knifeworks, in their Etsy shop, and I love it. I know Kirinite and G-10 primarily as knife handle materials, and I imagine that’s part of the reason this knifemaker uses them for worry stones: He’s already used to working with this stuff. G-10 and Kirinite are light, incredibly tough, and come in all sorts of flavors. There’s a lot going on in the Kirinite, including sparkles, swirls, and occlusions; it’s hard to capture in a photo. The G-10, being composed of layers of fiberglass and resin, can have some texture to it depending on how it’s finished. My “stone” has a mix of polished and slightly rough surfaces on the bottom. Dimension-wise, it’s 1 11/16″ long, 1 3/8″ wide, and 3/8″ thick, and weighs almost nothing — just 0.7 oz. This is a great size and shape in-hand, but also for spinning on the table, standing on edge, setting flat so it won’t slide off the desk, and so on. I love fiddling with it. It’s exceptionally well-made (good knifemakers are amazing with details! ), with no sharp corners, a well thought-out shape and form factor, and a completely seamless transition between the two materials. I couldn’t be happier with it. 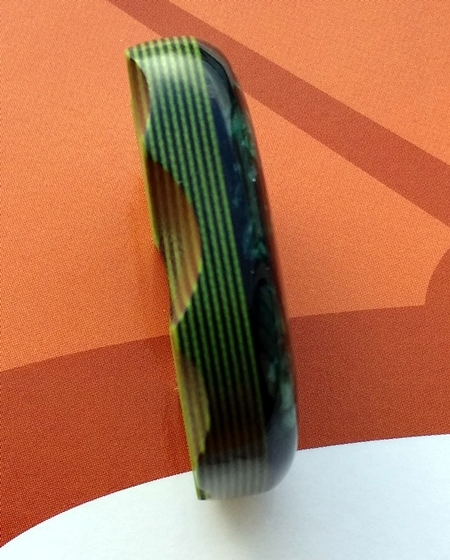 Well, I didn’t need a worry stone, but I now have a Titanium one in the mail. Very cool stuff! Next up I’ll probably get The Fifth Season. Awesome! Those Ti stones looked really cool. I hope you like it!